The story Frank tells in his new memoir of Robert McNamara’s visit to Harvard in 1966 is, to put it generously, incomplete. One of the “stupidest” decisions Barney Frank ever made, he says in his new memoir, Frank: A Life in Politics, was bringing Secretary of Defense Robert McNamara to Harvard in the fall of 1966, at the height of the Vietnam War. I agree; I was there. But the story Frank tells in his book is, to put it generously, incomplete. What he did was even stupider than he acknowledges. McNamara, Frank says, was “temporarily captured by a mob of Harvard students.” That was Frank’s fault, he acknowledges. At the time he was director of student affairs at the Institute of Politics at the Kennedy School. In bringing the secretary of defense to Harvard, Frank says, he was only trying to “facilitate genuine conversation” between Harvard students and “important people.” What could be wrong with that? Everyone understands that Harvard students need to converse with important people, and of course these would be “private sessions that were closed to the media.” But, Frank concedes, by the fall of 1966, “the government’s conduct of the Vietnam War had become emblematic of antidemocratic secrecy and a lack of public accountability.” So it was stupid to think some people wouldn’t object to McNamara and the war he was running. But there was a lot more to it. To Frank’s credit, he doesn’t make the same mistake many have made—describing that demonstration as an effort to prevent McNamara from speaking on campus. Many have written that he was “shouted down” at a “speech.” That’s completely wrong. Antiwar students were demanding not that McNamara be silenced, but precisely the opposite: that he speak to the public, that he agree to a public debate about the war. Barney Frank left that part out of his book. Harvard-Radcliffe SDS proposed that McNamara debate a young editor of Ramparts magazine named Robert Scheer. Sixteen hundred people signed a petition demanding a debate. That’s what Barney Frank refused to agree to. He insisted that all McNamara’s “conversations” be scheduled at closed, invitation-only events—with Barney Frank in charge of the invitation list. Of course none of the anti-war students were invited. Nevertheless SDS promised not to disrupt McNamara’s private meetings with students. SDS also promised we would “physically confront” the secretary when he left his private meeting in Quincy House, “asking him either to agree to debate Scheer or answer questions right there” (the quotes are from the SDS newspaper New Left Notes). Quincy House residents hung sheets out their windows that declared “Kill the Cong,” “Back Mac,” and “Napalm SDS” (along with another that read “Black Day for Gordon Linen,” which had unwittingly provided the sheets). Loudspeakers blared “Mack the Knife” across the courtyard. McNamara agreed to answer questions and got on top of the car with Michael Ansara of SDS, who had a microphone. McNamara opened by saying he had been a student at Berkeley, “doing some of the same things you’re doing here. But there was one important difference: I was both tougher and more courteous.” Then while the TV news cameras rolled, he shouted vehemently, “I was tougher then, and I’m tougher now!” The kids laughed and jeered. The first question was about the origins of the Vietnam War. “It started in ’54-’55 when a million North Vietnamese flooded into South Vietnam,” McNamara said. “Goin’ home!” somebody shouted. The next question was about the number of civilian casualties in the South, “We don’t know.” Mac said. “Why not?” people shouted. “Don’t you care?” Mac tried again: “The number of casualties….” but he was drowned out my cries of “Civilian! Civilian casualties! Napalm victims!” A few Progressive Labor members in the front were screaming “Murderer! Fascist!” At that point “a flying squad of Harvard and Cambridge policemen” arrived, as Barney Frank reports in his book, rescued the secretary and his young host, and conveyed them to his next meeting—with Harvard professor Henry Kissinger. So what made Frank’s actions so “stupid”? He concluded that the whole thing had “inflicted political damage on the Democrats,” who lost a lot of ground in the 1966 midterm elections, which came a few days after the McNamara incident. The students’ tactics and goals, he says, split the Democratic Party and opened the door to Nixon. In fact, however, Johnson had run for president two years earlier promising that he would not send “American boys nine or ten thousand miles away from home to do what Asian boys ought to be doing for themselves”—but by the time McNamara came to Harvard, he and LBJ had sent almost 400,000 “American boys” to Vietnam. Barney Frank is wrong about the “stupidest” thing he did. 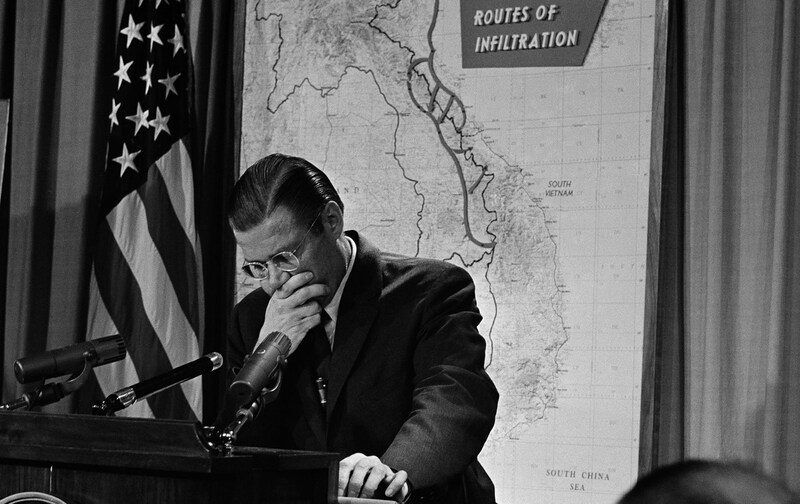 It wasn’t bringing McNamara to Harvard—it was his failure to join the movement calling for an end to the Vietnam war. Jon Wiener was a grad student and member of Harvard SDS in 1966; he wrote about McNamara at Harvard for the SDS publication New Left Notes.